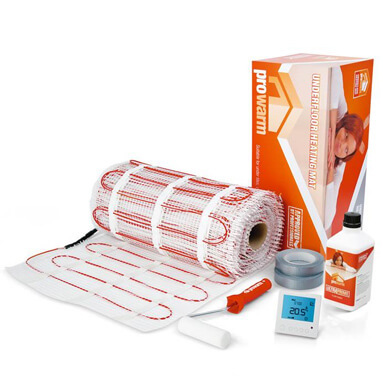 ProWarm 100w underfloor heating mats provide a very economical heating solution for large floor areas. They are NOT suitable as a primary heating source, but are ideal as a secondary source for large tiled areas. They consist of a thin loose wire, which is evenly spaced and attached to a glass fibre mesh. This allows for fast and safe installation. ProWarm 100w underfloor heating mats are available in the following square metre sizes (please choose from the drop-down box above): 1M, 1.5M, 2M, 2.5M, 3M, 3.5M, 4M, 4.5M, 5M, 6M, 7M, 8M, 9M, 10M, 11M, 12M, 13M, 14M, 15M, 16M, 17M, 18M, 19M, 20M, 21M, 22M, 23M, 24M, 25M, 26M, 27M, 28M, 29M & 30M. The maximum mat size in one piece is 12m2 - anything larger is supplied as multiple mats.